recognized by various researchers. 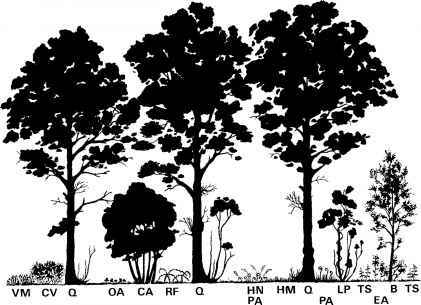 Tropical forests provide the biggest challenge in this respect and there have been various attempts at imposing a structural identity, ranging from the identification of a large number of horizontal and vertical layers to the more simple division of the canopy into two along the morphological inversion surface (Fig. 1.5). This separates the lower layer of densely packed tree crowns, which are often interwoven with lianas, from the more open layer above where the broad crowns are widely spaced. Sole; et al. (2005) have developed this into the critical height hc below which gaps are scarce and form a fragmented landscape, and above which gaps are plentiful and form a 'fully connected' landscape. 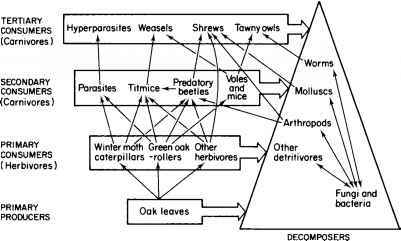 However, none of these schemes have proved inclusive enough to be useful over a range of forests and, as Whitmore (1984) notes, 'few concepts are likely so quickly to divide a room-full of [tropical] ecologists into two vociferously opposed groups as this one'. As noted above, one or more of the layers may be missing in a forest, mainly because the layering of vegetation is determined primarily by light availability. 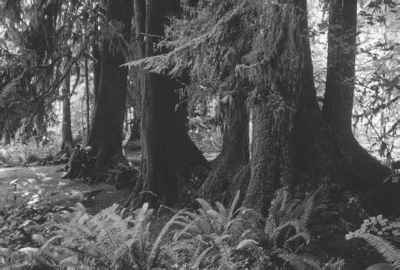 Thus, dense plantations may have no layers beneath the canopy except perhaps for a thin ground layer of shade-tolerant bryophytes. Similarly, a dense shrub layer, such as the introduced rhododendron in many acidic British woodlands, may preclude any layers below. Each layer provides niches for suitably adapted animals. For example, a study in an English woodland (Fig. 1.6) clearly showed that each layer in the woodland had its own species of foraging birds. Many other examples could equally well have been used. Dense field and ground layers, although aesthetically pleasing and providing numerous animal niches, can cause problems for tree regeneration, swamping small seedlings, even though most trees have large seeds which aid early growth (see Chapter 3). This is one reason why, in temperate rainforests, seedlings are often most common on nurse logs that are continuously damp enough to provide moisture and lift the seedlings above the dense field layer (Fig. 1.7). Vertical zonation continues below ground. In the Wyre Forest example used above (Fig. 1.4) the roots of the creeping soft-grass Holcus mollis would be in the top 2 cm of the soil, bracken rhizomes Pteridium aquilinum around 5 cm down, and bluebell bulbs Hyacinthoides non-scripta down to 10-12 cm. 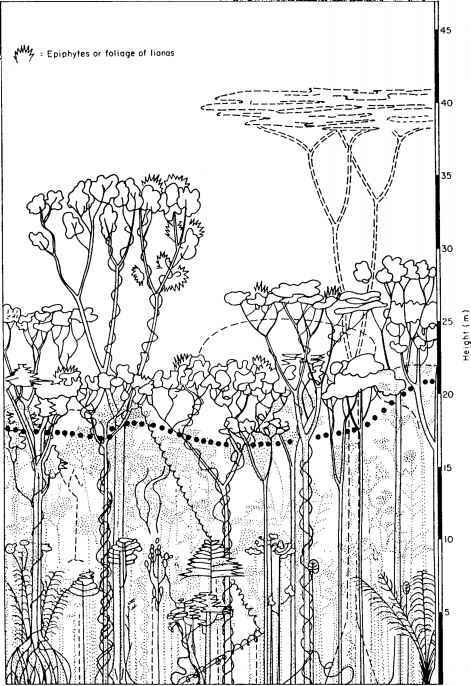 Such vertical stratification of roots of herbaceous plants may help in reducing competition between them. other xeric (dry) woodlands, especially amongst older trees (Domec et al., 2004). The amounts can be significant; in a 19-m high mature sugar maple Acer saccharum it has been measured at around 100 litres per tree each night compared with a water use (transpiration) of 400-475 litres the following day (Emerman and Dawson, 1996). Of interest here is that other plants are known to benefit. In Mediterranean Aleppo pine forests Pinus halepensis, the shrub Pistacia lentiscus had improved water status when growing beneath large pines (Filella and Penuelas, 2003-4). Water movement in black pine Pinus nigra, in north-east Spain, has been tracked using deuterium marking; enriched water was found in the stem water of the pines themselves and also neighbouring plants of holm oak Quercus ilex and the top 15 cm of the soil (Penuelas and Filella, 2003). As well as a vertical spatial pattern, above and below ground, there is also a temporal pattern in which active growth commences at different times in particular species, leading to the formation of aspect societies in woodland glades where the plant community is dominated by one or several species at a particular season and whose appearance changes markedly over just a few weeks in spring. In many English woods, including those of the Wyre Forest, bluebells appear first in spring, followed by creeping soft-grass, with bracken considerably later.